How I researched the opportunities available. Previously trained in accountancy, redundancy led Tim Bone to look for an opportunity to work for himself. 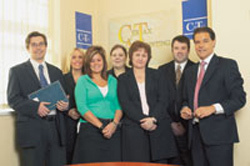 Tim attended a number of franchise exhibitions where his research led him to the accountancy service CerTax Accounting. After speaking to CerTax Accounting's representatives, he made sure the company met his criteria, getting all his questions answered on his possible future investment. Tim then took the time to contact a number of existing CerTax Accounting franchisees, whose positive responses and feedback assured him of the opportunity. An important factor to Tim was researching the level of training and support a franchise would provide, and CerTax Accounting certainly met his requirements. 'The training was excellent and very valuable,' he enthuses. 'Importantly, being my first business, it taught me all about running a professional service.